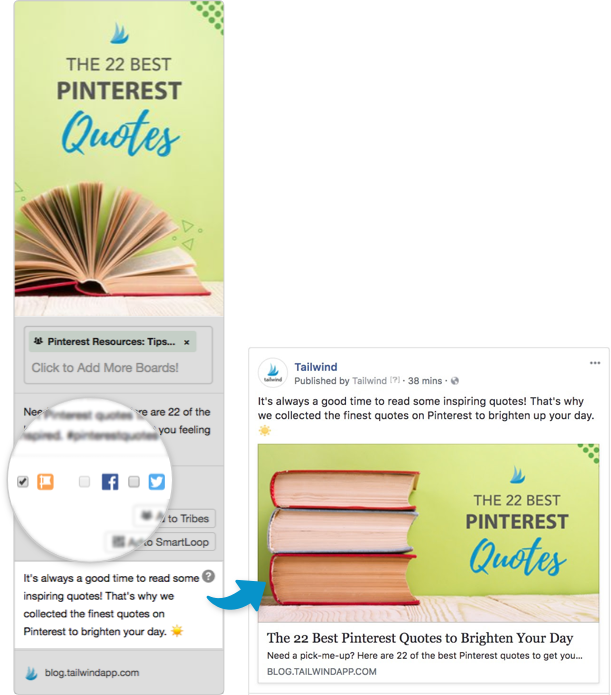 You've been able to post to your Facebook profile with our Pinterest integration for a while, but now we integrate directly with Facebook which means that you can post to Facebook Pages too! It takes less than a minute or two and could save you hours! Sync your Facebook Page with your Tailwind account. You'll be asked to log in to Facebook so we can connect to your Pages. Make sure to log in with a Facebook account which has Admin or Editor level access to the Page which you want to enable scheduling to. After connecting to your Facebook account, you'll be shown a list of the Pages you have Admin or Editor access to. Choose the correct Page from this list. Note: At this time you can only connect to one Facebook Page per Tailwind account. This means that if you manage multiple Pinterest profiles through your Tailwind account you'll need to choose a single Facebook Page to publish to. We do have a workaround though! While you can only have one Facebook Page connected at a time, you can change this Page at any time though by selecting a new one here. Pins will publish to the Facebook Page that was synced with Tailwind at the time they were originally scheduled. This means you can change your connected Facebook Page, and then schedule a new batch of Pins to publish to a different Page! To post to a Facebook Page simply check the box beside "Post to Facebook Pages" on any post in Tailwind, enter a Facebook Description and add the post to your queue. The post will publish to both Pinterest and your Facebook Page at the scheduled time. Best of all, Facebook will scan the page you share looking for images and include the one it thinks will work best on Facebook (as in the picture above). By including this simple extra step in your Tailwind workflow you could save yourself a ton of time finding and posting content to your Facebook page! Posts published to a Facebook Page won't necessarily use the same image as your Pin does. When publishing to a Facebook Page, we look for Facebook Metadata on the source URL to know what image to use. For us to pull a specific image from the source URL, you'll need to make sure that you have this metadata within the site code on that source URL. This sounds complicated, but it's actually fairly simple to set up - especially if you use a CMS like WordPress to run your website. Want to set up Tailwind to Publish to your personal Facebook profile as well? You can do that too! Check out this knowledge base article for more information. When thinking about your content being surfaced on Pinterest, don’t rely on the preconceived notion of hashtags to be found. Craft pins that will be useful to pinners with thoughtful, keyword rich descriptions and add them to boards with defined categories. In fact, you can’t create a post on Pinterest without an image.